Held for the first time since a tragic crush killed hundreds, this year the festival passed without incident. With a terrific sense of relief, Cambodia has held its first Water Festival since 2010, the year 353 people, mainly youths, were killed in a tragic crush on Diamond Island Bridge, raising serious questions about the government, the police, and their ability to control large crowds effectively. The future of the cherished festival had been in doubt ever since and apprehension ahead of this year’s boat races was palpable across a capital that is experiencing rising street crime. However, over the past week security has been tight and orderly, made easier by a substantial drop in numbers and heavy evening rains. Authorities had expected 2.7 million people to make what is traditionally an annual pilgrimage from the countryside to the city for a festival that marks the end of the rainy season to attend the races along the Tonle Sap. Instead the number was about half that, spread over three days. 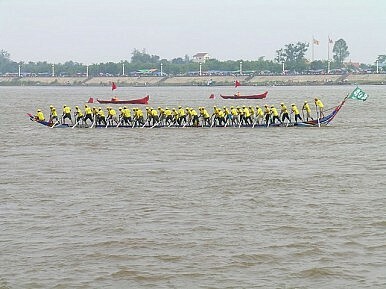 Also at this time of year, the Tonle Sap changes direction and boat races finish where it feeds into the Mekong River. In past years up to a fifth of the country’s population, or more, could be seen crammed along the riverside, shoulder-to-shoulder, jostling for a view. Large crowds have always posed a big threat. The festival was cancelled in 2011 in response to the deadly stampede. Then, it was not held a year later due to the death of former monarch Norodom Sihanouk and was cancelled again in 2013 amid ongoing protests over controversial elections. American photographer Al Rockoff said each water festival was different. He has covered “eight or nine” of them and with numbers down he found this year’s festival not as visually exciting as previous efforts but felt that authorities had done a good job. “They decentralized everything,” he said. As part of a broader plan to cut numbers in the capital, the government encouraged boat races in provincial cities, like the southwest coastal town of Koh Kong, as an alternative venue. The peninsula that divides the Mekong River with the Tonle Sap has also been transformed from cow paddocks into an urban environment over recent years. It is capable of holding hundreds of thousands of people on its banks. Sotheavy Nou, a restaurateur and writer, said business was down on previous festivals with events being staged in Sihanoukville and Siem Reap winning patronage that normally would have gone to Phnom Penh. Eight of the 245 boats – each carrying dozens of rowers – won awards for overall racing and appearance. More than half of the total number boats swore some type of allegiance to Cambodian Prime Minister Hun Sen, but only one went home with a win. English language instructor, Adam John Clarke, said it was a relief that crowds were not as overwhelming as in previous years and more space meant pedestrians could walk on the streets. “The police were friendly and were not asking for money from anyone, I thought it was the best water festival yet,” Clarke, a veteran of more than 10 such festivals, said. More than 5,000 people were treated for health problems but only two were hospitalized. Among the biggest complaints were three men masquerading as officials who were arrested for fleecing street vendors with false fees. Handbag and smartphone thieves were also active but by the end of the party authorities were being roundly applauded for staging a return of an event held dear by all Khmers. And in Cambodia, that sort of praise has been rare in recent times.